Informational meetings for Truman’s Europe in Transition Program will take place Nov. 26, 27 and 28 at 4:30 p.m. in Violette Hall 1400. The Europe in Transition Program combines study and field trips using the setting of Europe, focusing on the examination of current issues and problems in the European Union, the economy, and the political and social climate. The course is scheduled for May 16-June 2, 2013. The itinerary includes stops in Prague, Czech Republic (May 16-19); Vienna, Austria (May 20-21); Budapest, Hungary (May 22-23); Rome, Italy (May 24-27); Florence, Italy (May 28-30); and Venice, Italy (May 31-June 2). Students in good standing are eligible to participate and will be admitted to the program in the order in which the applications are received. The deadline for program application is Jan. 18. To receive six credit hours students must attend pre-travel classes and lectures, must keep a journal during the overseas experience and must complete a paper after returning. For more information, contact Jason Lin at jlin@truman.edu, Keith Harrison at kharriso@truman.edu or go online to business.truman.edu/students/Europe7.asp. Former Bulldog standouts will have the chance to re-live their athletic achievements at the Missouri Sports Hall of Fame induction ceremony set to take place at 6 p.m. Dec. 5 in the Student Union Building Georgian Rooms. Among the honorees, four individuals have former or current ties to the University. Award-winners include: Shane Cavanah, member of the Bulldog football team in the 1960s and state-title-winning high school football coach; Gerald “Shag” Grossnickle, Truman’s all-MIAA fullback known for his diligent work as one of northeast Missouri’s top conservationists; Dr. John Bailey, a regionally recognized orthopedic surgeon and the University’s acting team physician since 1997; Ben Pitney, assistant men’s basketball coach from 1971-1994 and current director of Athletics for Hannibal-LaGrange College. Acknowledgement will also be given to Truman’s 1969, 1970 and 1971 football teams. Ranked as underdogs in the conference, the program went on to win three straight MIAA championships under the leadership of coach Russ Sloan. The Missouri Sports Hall of Fame, established in 1994, works to honor athletes from across the state who have proven themselves to be an inspiration to up-and-coming athletes as well as showing a distinct expertise in their respective sport(s). Tickets for the event are $75 and can be purchased by calling the Missouri Sports Hall of Fame at 417.889.3100. This spring IT Services will continue to offer monthly Banner training covering “Banner Navigation Basics and Review” and “Running Reports in Banner.” A limited number of fall training courses are still open as well. The navigation class reviews the basics of moving around in the Banner forms with some tips and tricks for using the various form types and searching for information. While the “Running Reports in Banner” class concentrates on the report running process and demonstrates how to get the data into usable electronic format, including hands-on report running and importing delimited data into Excel. Both classes are appropriate for new users seeking to learn more about the programs and occasional users looking for a refresher. IT Services is also offering a new session called “Banner Reporting Review for Academic Departments,” which will discuss the Banner reports available to various academic schools and departments. To register for any of the Banner training sessions, go to eventmanager.truman.edu, click “Login” and enter a Truman Network username/password. Select “View Events or Register for an Event” then select the “Department is” drop down and choose “Information Technology Services.” Click “Search” and select the desired session from the list of IT classes. Several Truman students presented projects at the Missouri Undergraduate Psychology Conference, which took place Nov. 9-10 at Westminster College in Fulton, Mo. Students Sarah Jo David, Erin Schroeder and Kayla Maassen won an award for outstanding presentation during their session. Their project, “Workplace Forgiveness: A Preliminary Model,” was mentored by Teresa Heckert, professor and chair of psychology. Other presentations by Truman psychology students included: “Language Deficits following Traumatic Brain Injury: A Meta-analysis” by Kayla Maassen and Crystal Stonebarger, mentored by Jeffrey Vittengl, professor of psychology; “Effects of Word List Content on Source Attributions using the DSM Paradigm,” by Kerry Lee and Kelsey Spalding, mentored by Robert Tigner, professor of psychology; and “Student Engagement, Personality, Positive and Negative Affect, and Subjective Well-being in College Students” by Sarah Jo David and David Schultz, mentored by Michele Breault, professor of psychology. 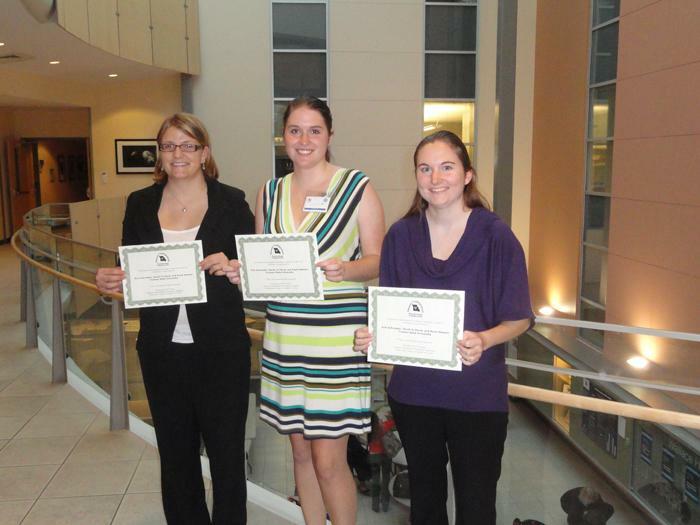 Students, from left to right, Sarah Jo David, Erin Schroeder and Kayla Maassen display their awards for outstanding presentation during their session at the Missouri Undergraduate Psychology Conference. Professor Chris Naffziger will host an art history forum entitled “You Spent How Many Years Working on This? Reflections on Mounting a Major Renaissance Painting and Drawing Exhibition” from 4:15-5:30 p.m. Nov. 29 in Ophelia Parrish 2210. Naffiziger’s talk will focus on his contributions to the major exhibition currently on display at the St. Louis Art Museum. The display features more than 130 paintings and drawings by sixteenth century Italian artist Federico Barocci. Following the conclusion of its time in St. Louis the exhibition will travel to the National Gallery in London for display. The exhibition in St. Louis will be the first showing in the United States especially devoted to Barocci’s paintings and drawings. The artist is considered by many art enthusiasts to be one of the great colorists of the Renaissance era. His works are considered important precursors of Baroque-era masters like Peter Paul Rubens. The event, sponsored by the Art Department and the University Art Gallery, is free and open to the public. This Minnesota-based group is known for its unconventional combination of just four voices and a tambourine. 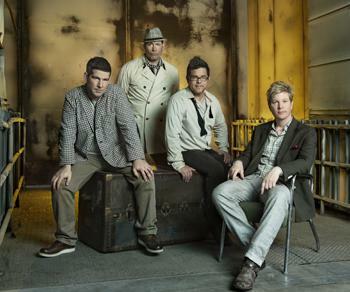 At their Truman performance Tonic Sol-fa will showcase an interactive holiday set including well-known Christmas songs from past and present holiday albums. This will be Tonic Sol-fa's second visit to the University as part of the Lyceum Series. They first performed on the Truman stage Sept. 25, 2007. Students may pick up their free ticket at the Student Activities Board Office in the Student Union Building. Faculty and staff may get their free tickets at the information desk in the Student Union Building. General admission tickets cost $7 and are available at the Truman Cashiers Window in McClain Hall or downtown at Edna Campbells. Tickets may also be purchased online at lyceum.truman.edu. Truman Bookstore – Follett Higher Education Group is a Platinum level sponsor of this event. Due to several recent bike accidents, the Department of Public Safety would like to remind all cyclists of the campus safety guidelines. • Anyone operating a bicycle must obey the same traffic control regulations that apply to cars and motorcycles, such as stopping for stop signs and riding in the right-hand portion of the roadway. Bicyclists must also obey one-way streets designations and are subject to all traffic laws. • When cycling on the roadway bicycles must be ridden with the flow of traffic and not against it. • Bicycles ridden after dark must be equipped with a headlight, large red reflector on the rear and white or amber pedal and spoke reflector. • Bicycles parked on campus must be left in bicycle racks, which are provided in locations outside of most University buildings. Bikes are not to be left in buildings, entrances, ramps or any other hazardous location. They should not be attached to any trees or light poles. Bicycles that are illegally parked are subject to parking tickets and/or confiscation by the Department of Public Safety. • Bicycles should be ridden on streets, not on sidewalks, lawns or University-maintained parkways. • Students are strongly encouraged to register their bikes with DPS. Registration permits are issued free of charge. Truman supports the use of bicycles as a means of transportation, but ultimately the safety of all campus pedestrians is of first priority. More information on the biking policies may be found at police.truman.edu/parkingservices/parkServ.asp. Specially marked mail bins will be placed in all of the departments on campus as well as the residence halls for people to place their cans and other non-perishable food donations. Apply now to be an orientation leader this summer. Orientation Leaders will receive a stipend and gain valuable leadership and professional experience while helping students enroll for classes and discussing transitional issues. Applications are available online at ol.truman.edu. Direct any questions to Jacob Funke at jfunke@truman.edu or 660.785.4232. Applications are due on Dec. 7. Upperclassmen interested in pursuing a career in international affairs may now apply for the Carnegie Endowment for International Peace’s competitive fellowship. The program is a full-time, one-year commitment. Applicants should possess an interest in monitoring and advancing global cooperation among nations, especially concerning the U.S.’s role in the international community. Michael Bump, professor of music, served as host/coordinator for the Percussive Arts Society’s annual International Conference at the Austin Convention Center, Oct. 31-Nov. 4 in Austin, Texas. Along with two colleagues from the Eastman and Northwestern Schools of Music, Bump organized concerts and presentations that focused on the centennial celebration of twentieth century composer, John Cage. While at this year’s conference, Bump was also elected chairman of the society’s New Music & Research Committee. With an international membership of more than 10,000, the Percussive Arts Society serves as the field’s premiere professional organization. Approximately 6,000 artists, composers, educators and students were in attendance at this year’s conference. Jerrold Hirsch, professor of history, chaired a session, “Constructing and Constructed History,” and presented a paper “‘My Fancy Is Restricted by Records’: ‘Scientific’ History,’ U. B. Phillips, and Black Lore,” at the annual meeting of the American Folklore Society in New Orleans, La. Members of Truman’s local chapter of the American Association of University Professors attended a recent regional workshop of the Assembly of State Conferences of AAUP, “The Faculty Voice in Missouri, A Regional ASC Workshop,” which took place Nov. 10 at Washington University in St. Louis. The Missouri Conference president, David Robinson, professor of history, was one of the organizers of this event attended by about 50 faculty members from many public and private universities in the state. Speakers were national leaders of AAUP, including AAUP President Rudy Fichtenbaum and Howard Bunis, chair of AAUP’s Collective Bargaining Congress. In addition to Robinson, Truman’s chapter was also represented by Kathryn Brammall, professor of history and managing editor of Sixteenth Century Journal, and Betty McLane-Iles, professor of French and vice-president of Truman’s AAUP chapter. The Sigma Alpha Iota Chamber Musicale will take place at 6 p.m. Nov. 26 in the Ophelia Parrish Performance Hall. SAB will host an open mic night from 7-9 p.m. Nov. 27 in the Student Union Building Down Under. Acts are limited to 10 minutes and are open to any talent. Sign up outside the SAB Office or on the SAB Facebook page. Freshmen members of the theatre program will perform “An Adult Evening of Shel Silverstein” at 8 p.m. Nov. 27 in the James G. Severns Theatre located in the Ophelia Parrish Building. This is a one-night-only event and is not considered suitable for children. Email theatreboxoffice@truman.edu for more information. Students for Social Change will host a film festival Nov. 27 and 29. “Miss Representation,” a film on how the media’s portrayals of women are affecting their access to positions of power, will be screened at 8:30 p.m. Nov. 27 in the Baldwin Little Theatre. “Flow,” a film about the political and environmental aspects of the privatization of water, will be screened at 8:30 p.m. Nov. 29 in the Baldwin Little Theatre. The Physics Colloquium will continue from 4:30-5:30 p.m. Nov. 28 in Magruder Hall 1000. This presentation will feature speaker Sriram Sundararajan, of Iowa State University, and will focus on the investigation of interfacial phenomena at the micro/nanoscale to enhance the engineering of surfaces. The International Student Affairs Office is seeking to fill positions for the spring 2013 semester. Two new cultural integration leader positions are available. In addition, an office assistant position is open to those interested in assisting and maintaining the office’s website. Applications can be found on Tru-Positions and are due by 5 p.m. Nov. 28. A Jazz Combo Concert, sponsored by the Music Department, will take place at 7 p.m. Nov. 28 in the Ophelia Parrish Performance Hall. The Truman Faculty Forum will continue at 7 p.m. Nov. 29 with a presentation by Tom Zoumaras, professor of history. The World AIDS Day Memorial Service will take place at 7 p.m. Nov. 29 at the Eternal Flame by Kirk Memorial Building. Grants-In-Aid-of-Scholarship and Research applications should be submitted online at secure.truman.edu/osr-s/ by 11:59 p.m. Nov. 29. Email any questions regarding the process to the Office of Student Research at osr@truman.edu. The University Chamber Choir’s 8th annual Madrigal Dinner will take place Nov. 30 and Dec. 1. Tickets are $23 for adults, $17 for students and $7 for children and must be purchased in advance. For more information, visit madrigal.truman.edu. The University Orchestra concert will take place at 8 p.m. on Dec. 1 In Ophelia Parrish Performance Hall. The Phi Mu Alpha Holiday Showcase will take place at 2 p.m. Dec. 8 in the Ophelia Parrish Performance Hall.